I’ve covered streets in the Elmvale Acres housing development a few times already without even knowing it. 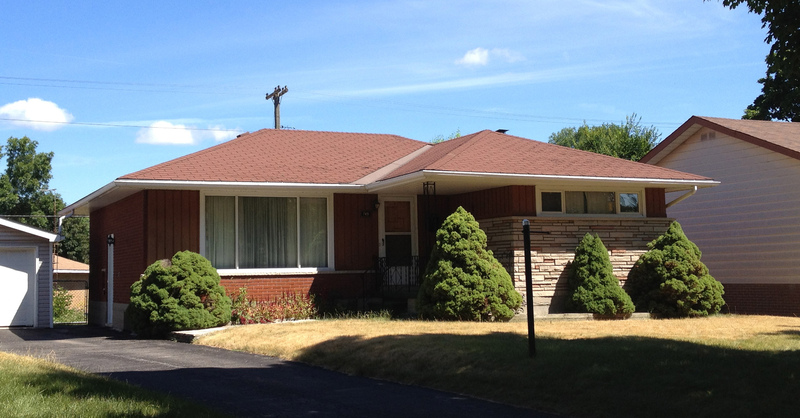 Created by Robert Campeau‘s company in the 1950’s, it comprised 1600 homes built on acres of farmland. It was his biggest housing development at the time. Now absorbed into Alta Vista, its existence is alluded to on my paper map by the Elmvale Acres Shopping Centre. A friend mentioned he had grown up in Elmvale Acres, so with fresh info and renewed interest, I headed over to visit the few remaining streets in the area to be hi-lited on my map. Figuring out the boundaries of Elmvale Acres proved a little tricky. The most detailed description I found was on this real estate website, which I’ve outlined below. Hope it’s right. 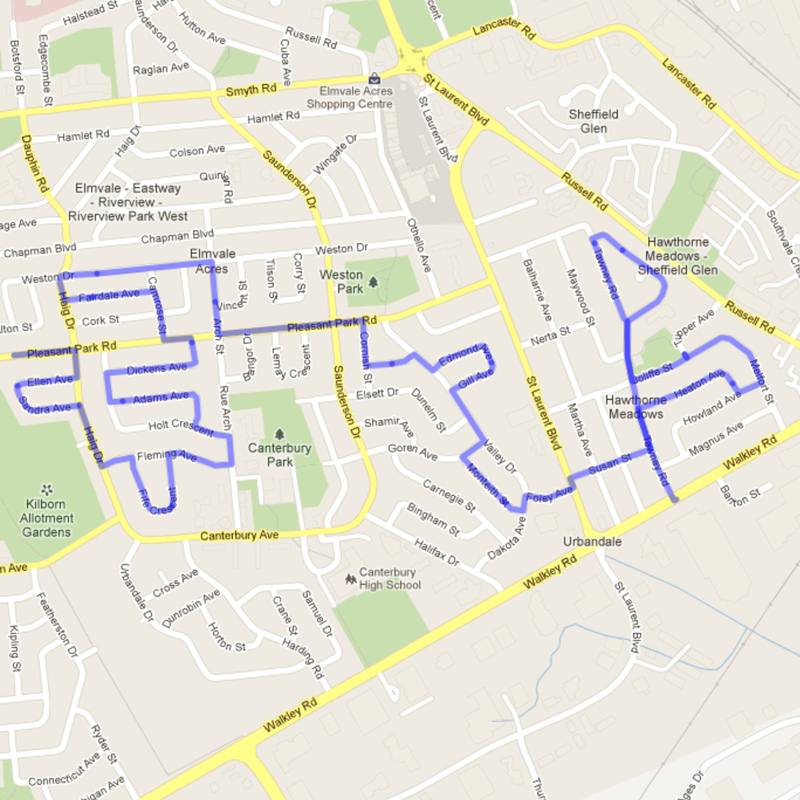 Here are the streets within Elmvale Acres I covered today. While the design of the buildings varied, it was interesting seeking out common details, figuring out which forms and proportions had survived the test of time. The varied flat stones on the exterior walls on this house, in combination with the rich red brick were a common detail, emphasized by the horizontal sills extending beyond the edge of the windows. I like it. Campeau is described in one of his biographies as having very high standards of quality control. The number of houses within Elmvale Acres retaining their original form would support this argument. For example this house with it’s vertical bands of brick appears to be original. The house in the photo below also appears authentic. The one to the left beside it in the same photo must have been identical, having since been renovated with the addition of a wooden deck and matching siding, but never completely shedding its original proportions. 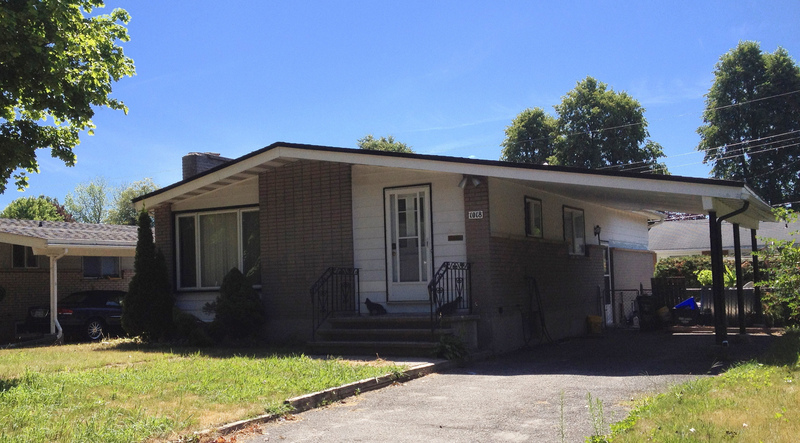 Similarly the house shown below, extensively renovated on the outside, will always retain it’s mid-century proportions. Those houses which have been renovated and taken on their own personality over the past 55 to 60 years have allowed this area to shed an overly dominant sense of repetitiveness that may have existed when they were built. The mature trees and gardens lining the streets contribute to this even more so. 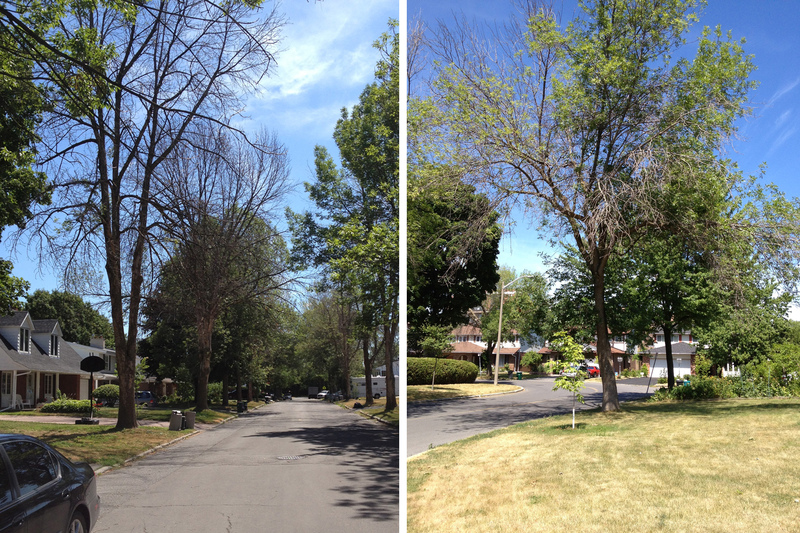 Tragically, on one of the last streets visited in the area today I noticed instances of the devastation being wrought by the Emerald Ash Borer Beetle, previously mentioned in this post. A sad sight, a time for rebirth. One defining feature Elmvale Acres has as a housing development which it shares with developments that followed is the lack of businesses within the community, something my ex-Elmvale Acres resident friend laments. As he pointed out, older communities in Europe as well as some within our region retain more mixed use, such as Centretown and Vanier. I heard the same opinion expressed by Bruce Firestone, interestingly, at a presentation on Lebretton Flats awhile back, summarized in this bloggers posting. Important stuff to ponder as our region evolves.